Pocono Mountains Corporate Center West is strategically located on Route 611 in Coolbaugh Township, Monroe County just north of the Pocono Mountains Municipal Airport and approximately 5 miles from Interstate 380. The project totals 400 acres zoned for commercial/industrial development. One hundred and fourteen acres have been designated Keystone Opportunity Zone (KOZ) and the remainder is approved for LERTA tax abatements. The site also has rail access and is served by the Pennsylvania Northeast Regional Railroad Authority. PMEDC acquired the parcel in 1999 and with the help of the County of Monroe, were able to create new inventory for business sites in Monroe County. 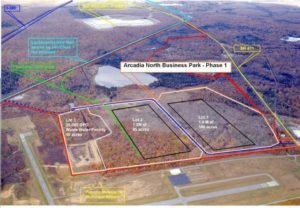 PMEDC has partnered with Arcadia Properties LLC of Bethlehem to accelerate the development and infrastructure construction. In March 2007, the park welcomed its first tenant, Johnson and Johnson Sales and Logistics Company LLC. This 1.4 million square foot distribution center project is located on Lot 1. Lot 2 is available and appropriate for another large user. Other lots for smaller projects are available along with some rail-served sites. Contact PMEDC for more information.